The Exchange Management Console (Export Mailbox Wizard) of Exchange 2010 helps to export mailbox data to another mailbox. Once the account has been granted the permissions, the user can perform the export action. First, open the Exchange Management Console. 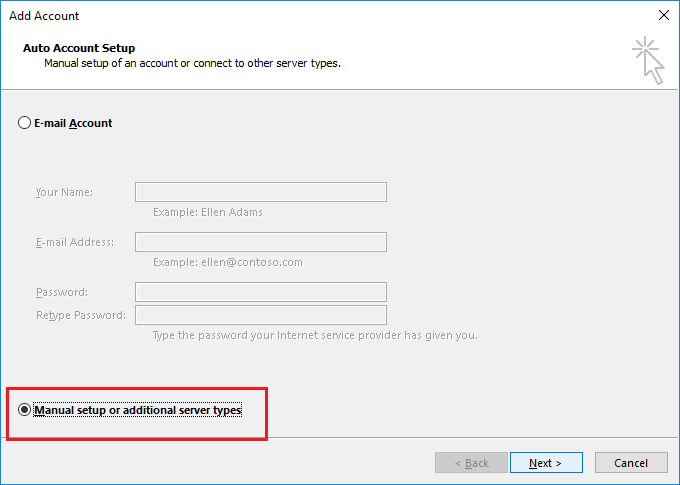 In Microsoft Exchange On-premises > Recipient Configuration, click on Mailbox. 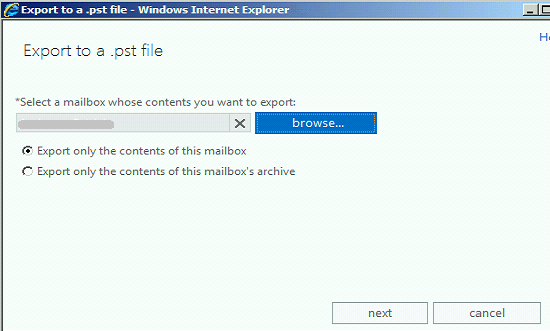 Now, select and right-click on the desired mailbox(es) and click Export Mailbox. In the Introduction page, Browse and select the target mailbox or provide a target a folder name. Then, click Next. In the Conditions page, select the filters according to your requirements. Click Next. Select the export options as per your need and click Next. Summary of the mailbox export is displayed. Verify it and click Export. The Completion page shows the result of the export. Click Finish. A new folder (specified earlier) would be created in the user mailbox (can be seen by accessing the user mailbox in Outlook). It seems easy to export mailboxes using the Exchange Management Console, but it exports the mailbox data to another mailbox only. It cannot export mailbox data to a PST file. 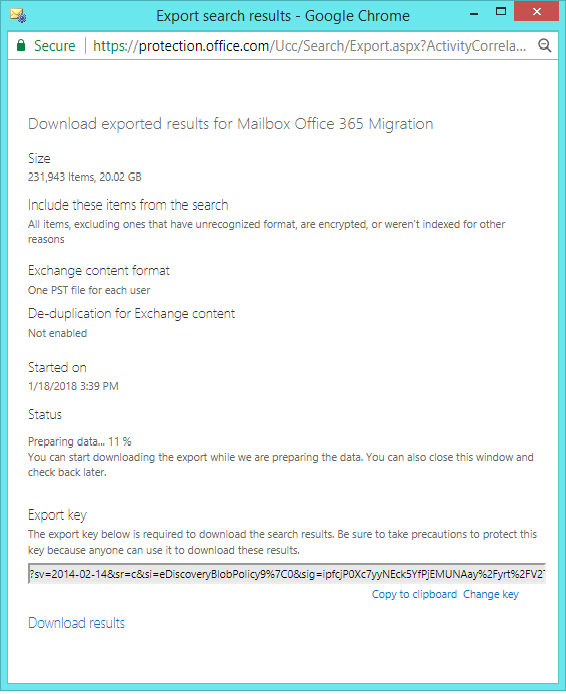 But there is an easier way of exporting EDB mailboxes to PST - Kernel for Exchange Server. Also, this Exchange Database recovery software repairs corrupted files before exporting them. This professional software is error-free, quick and efficient. The data is unharmed and unchanged in all manners during the export. Exporting Exchange 2010 mailboxes using the Export Mailbox wizard of the Exchange Management Console is described here. Along with that, a professional tool, Kernel for Exchange Server is introduced for quick and efficient EDB to PST export. Exchange 2010 users can choose any of these methods as per their requirement. 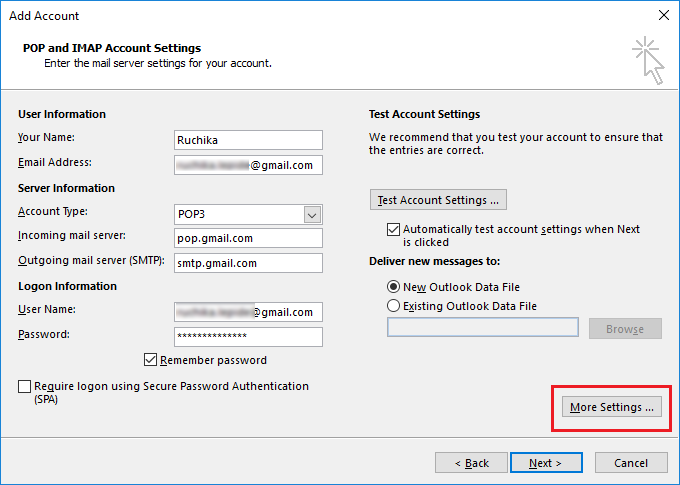 You can use IMAP or POP3 protocol to configure your Gmail account in MS Outlook. 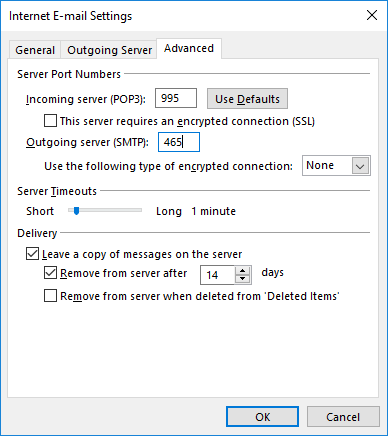 However, after using IMAP account in Outlook for some time, many users want to change their mail settings from IMAP to POP. Today we will discuss how quickly you can change your IMAP configuration to POP3. IMAP stands for Internet Messages Access Protocol. In an IMAP configuration, the email client keeps a copy of the mailbox on the local system without deleting it from the email server. The advantage in this case is that you can access your complete mailbox data through various devices (of course with proper IMAP configuration). Quick and easy access to emails from different geographical locations. In IMAP, any items deleted from the user system is still available on the server. POP3 is an abbreviation of Post Office Protocol version 3. When your email application is configured with POP, then all your emails are downloaded to your email application. 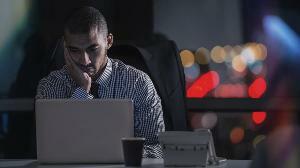 Then emails can (and should) be permanently deleted from the mail server. 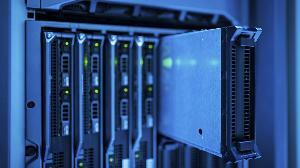 Your emails are stored on your system hard drive. Each time you configure POP3 on a new device, only the additional emails will be downloaded. This saves time in configuring the email account. In POP, opening and accessing attachments are quick because all the attachments are already downloaded. Click on File > Info > Account Settings. Then click on New to add a new account. Select Manual set up or additional server types and then click to Next. Now select POP or IMAP and then click to Next. Enter your POP details and then click on More Settings. Then move to the Advanced tab and enter POP and SMTP port numbers and click OK. Note: Here, you have an option to leave copy of messages on the server for a definite period. 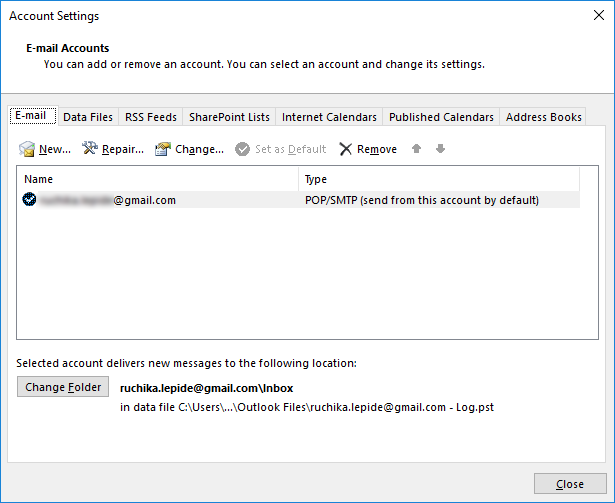 It will take few seconds, and your POP account is successfully added to Outlook. 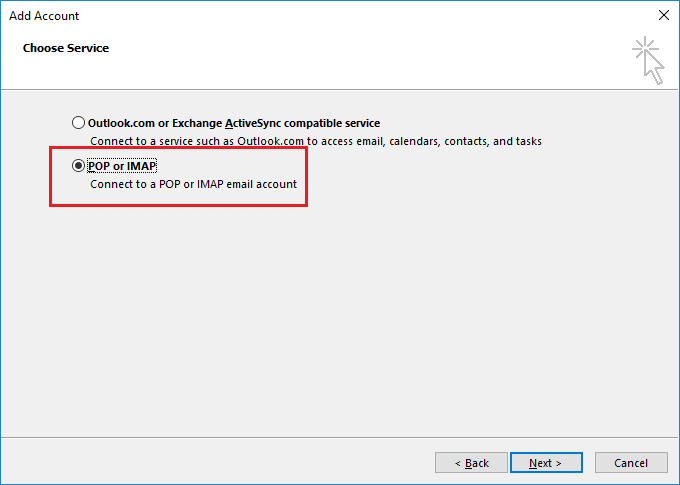 After successfully adding your POP account, you can remove your IMAP account from Outlook. Recently many users are migrating their IMAP email data to cloud emailing platforms like Office 365. This process is easy if you are using a third-party tool for migration. 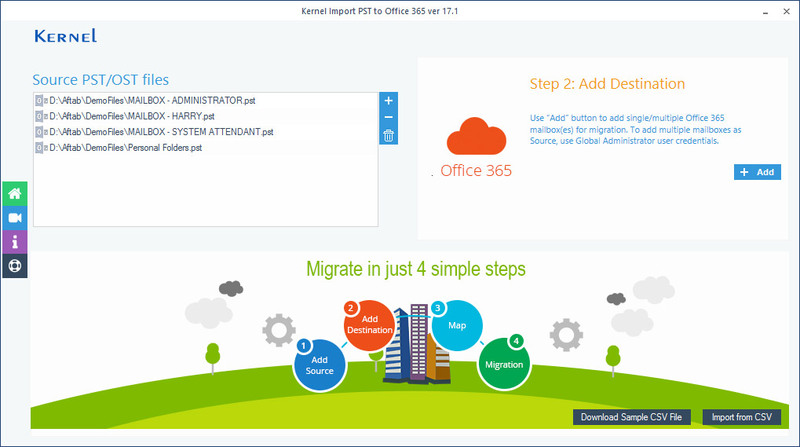 Kernel for IMAP to Office 365 is a brilliantly developed and designed tool to migrate IMAP account to Office 365, hosted Exchange and on-premises Exchange. With this, you can quickly migrate those mailboxes which are configured with IMAP settings. 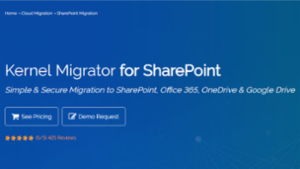 You can also migrate single as well as multiple mailboxes from IMAP email servers to Office 365. And this tool allows users to migrate emails to mailboxes, public folders and archive mailboxes in Office 365. Exporting an MBOX mailbox to Yahoo Mail is not an easy task if you are going to do it manually. The manual method is complicated as it is time-consuming, lengthy, and error-prone. 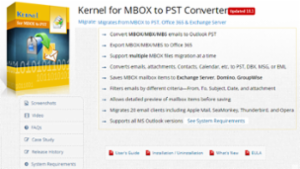 So, to avoid all these issues, you should use a third-party tool like Kernel for MBOX to PST Converter. Repair corrupt outlook PST and Exports to Office365, email servers (MS Exchange Server, Novell GroupWise, Lotus Domino), webmails (Google Apps Suite, Gmail, iCloud, Yahoo, AOL, and Outlook.com) with help of Kernel for Outlook PST Repair tool. Does this software can repair archive pst file? Yes Aidan, It can repair corrupt archive pst files and easily restore emails. The article is for all the Exchange users seeking smooth and effective EDB to PST conversion. Exchange Server is the most widely used platform for messaging with collaborative sharing, Exchange online, secure working environment, etc. A user faces above mentioned problem. Many times it happens with us that we try to open our MS Outlook, but it is continuously showing an error that “Outlook does not start.” People used to face a problem “Outlook is not responding,” this is because the MS Outlook heads some of the corruption issues. Outlook is most widely used Email client around the world for communication in an organization. However, what if we face such kind of problems? What we do in such problems when my Outlook is not Responding? How can I solve this issue? Today, I will help you to resolves your all issues related to this error, but before that, we will discuss what “Outlook 2013 does not start” error is? 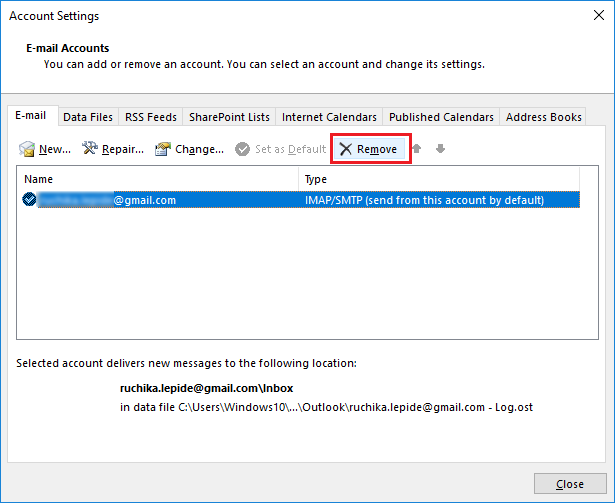 This error which is “Outlook 2013 does not start” or “Outlook is not Responding” faced by users when they are facing some corruption issues in their Outlook. These corruptions can be in their Outlook data files, or can be in their Outlook profiles or maybe their MS Outlook is being damaged. This error makes the Outlook does not open and makes all Outlook emails inaccessible. 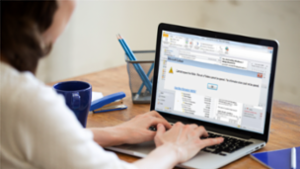 This error may also damage emails, attachments and Outlook data files internally. So, now we will discuss what the corruption issues that damage the Outlook and how can we resolve them are? Outlook does not open under some conditions when it has corruption. Below are the mentioned reasons and their solutions for issue “Outlook 2013 does not start” error. 1) Open Outlook in Safe Mode: Yes, this could be an issue sometimes its happen MS Outlook is not damaged and still, Outlook does not start. In such case, you should be careful to deal with it. Solution: To resolve above issue and to open Outlook in safe mode you have to follow some instruction. You have already tried to open Outlook, but it is not responding. Then click on start button and in run box type outlook.exe/safe and run this and follow rest instructions. After that, you can open your Outlook in safe mode. 2) Using Outlook in older Operating system: Many times it happens to us that we are using an older version of Operating system which leads to an error of Outlook does not start, or Outlook is not responding. Solution: To resolve the problem, you should be very careful about your Operating system version. If you are unable to update your OS version, then you should turn on the compatibility mode. To turn on this mode, find Outlook exe then choose its properties and turn on compatibility mode. 3) You have damage Outlook Profile: Damaged Outlook profile is kind of damage that is led by malware and virus attack. When a virus attack on your system and reaches to Outlook, it can damage your Outlook profile or maybe modify the details. Through which you will face the problem of unable to access Outlook. 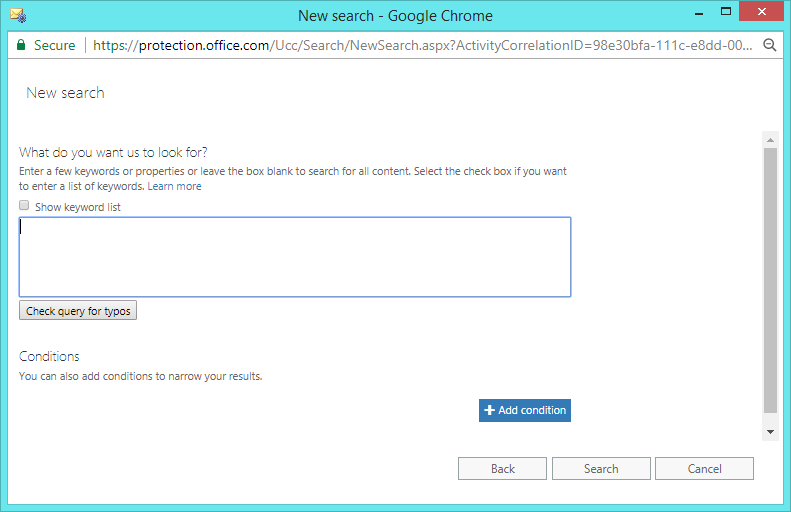 Solution: To resolve this issue, you need to repair your Outlook profile. If your profile is damaged by a virus, you have to repair it by using repairing tool. However, you can prevent Outlook profile corruption by using anti-virus in your system which prevents virus and malware attacks. 4) You have damaged Outlook data files: This can be a significant issue when you have damaged Outlook data files. Data files are exposed as a damaged file, and they also lead problem in starting Outlook. If Outlook has some damaged data files, then Outlook does not work correctly. Solution: To resolve this issue, you have to use Microsoft inbuilt repair tool which Inbox Repair Tool to repair damaged Outlook data files. However, your files are large then you should go for third party Outlook PST Repair Tool. Repairs damaged and large size PST files quickly. Recovers emails, attachments, and deleted items too. Repairs password protected PST with complete integrity. Does not impact change in the folder hierarchy and data format. 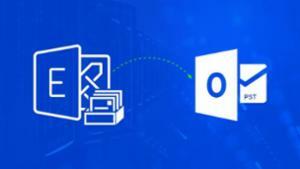 Export repaired PST files to Emails servers and Office 365. Apply inbuilt filters to segregate data in folders before saving. Offers a quick preview of the PST mailbox before saving. Support all versions of Outlook, Exchange & Windows OS. Download & install AzureAzcopy and copy SAS URL: Initially, you have to download and install the AzureAzcopy tool. For this, you have to log in to your organization’s Office 365 account using administrator credentials. 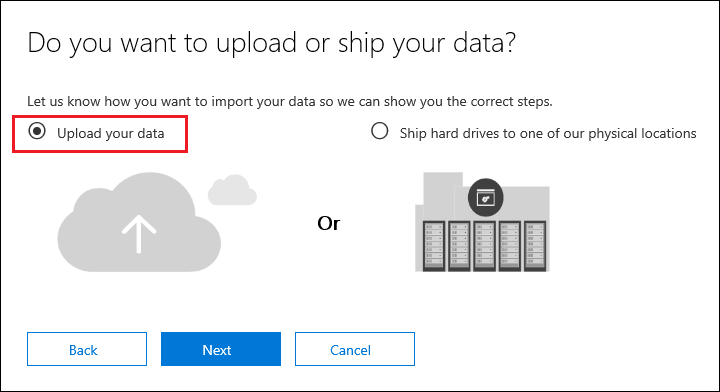 You have to choose either you want to upload your data, or you want to ship it physically. 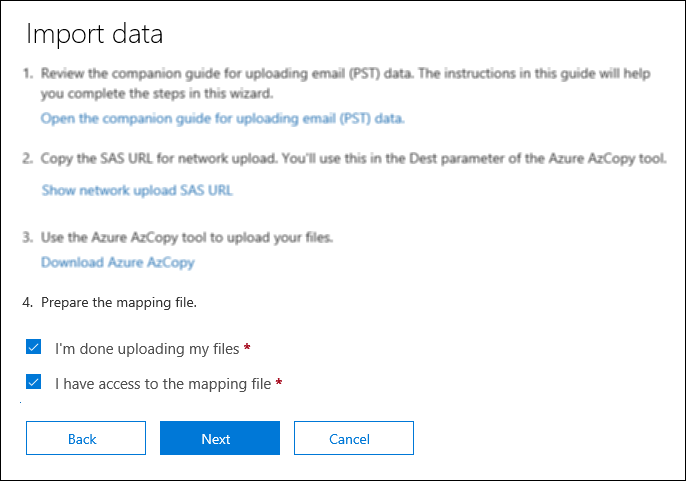 Upload PST files to Office 365: Now you can run the AzureAzcopy tool. Make sure that your PST file is located on a file share or file server in your organization. 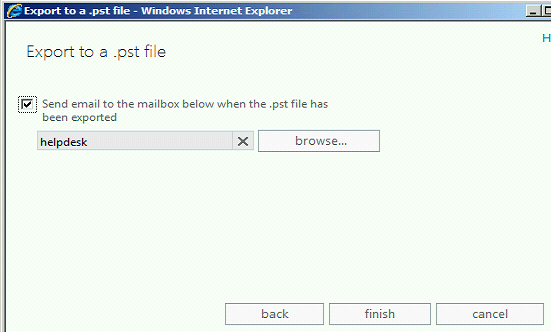 Preview your uploaded PST files: This is an optional step. 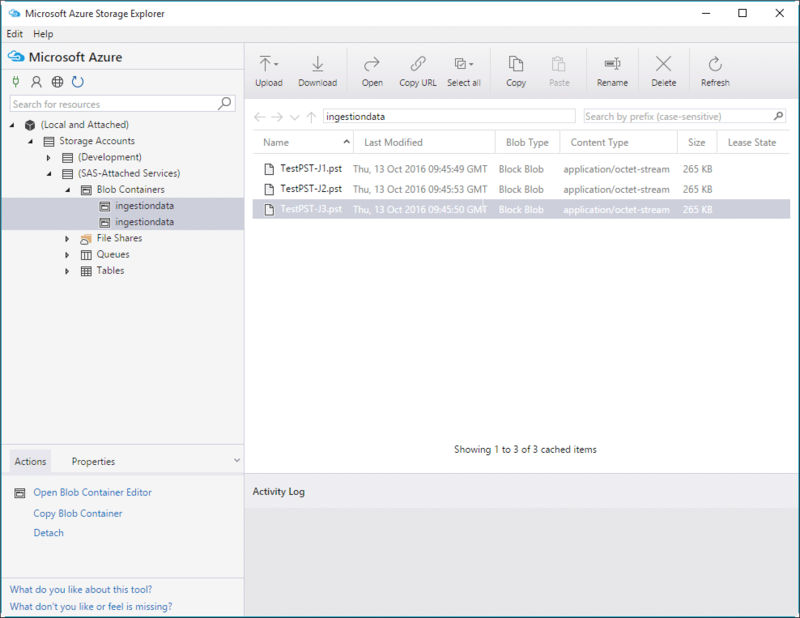 If you are going to view your uploaded PST files, then you have to download and install Microsoft Azure Storage Explorer. Using it, you can preview the PST files. 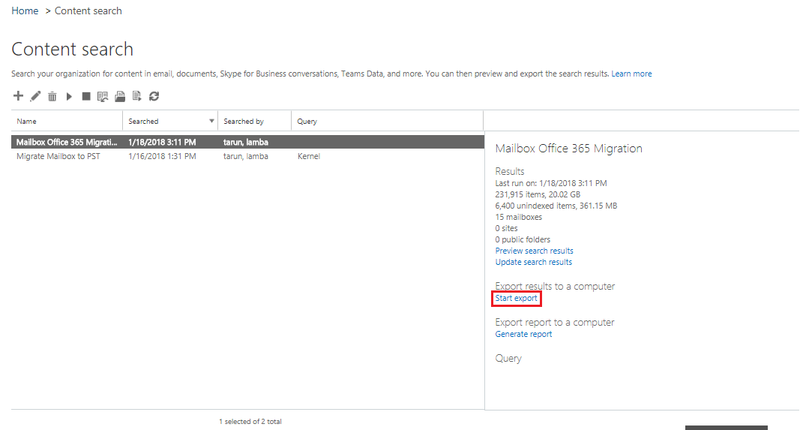 Map your PST file to Office 365 mailboxes: Once the PST files are successfully uploaded to the cloud storage, the next thing you have to do is to create CSV file. This CSV (a sample can be downloaded) maps PST files with Office 365 mailboxes. 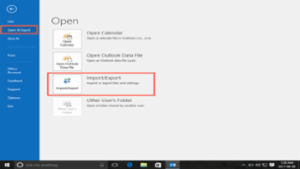 Create a job to import PST files: Now create a job that can import PST to Office 365. In this step, you can use the CSV mapping file you have created in the previous step. 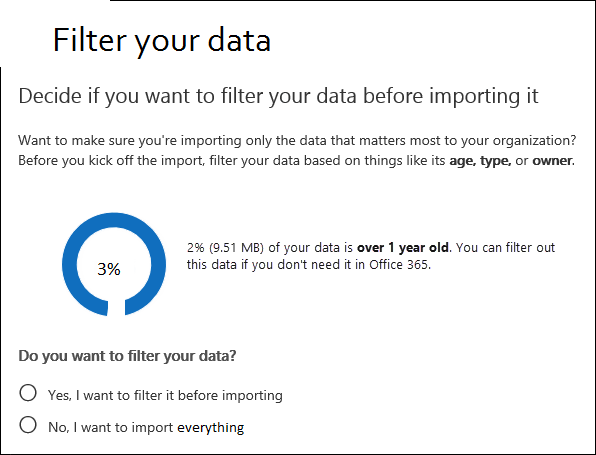 Set filters and start your import job: Once you have created the job, Office 365 analyzes data and allows to set filters on data before importing it to Office 365. Apply filters as per your need and then start your import job. 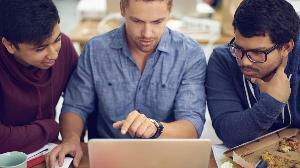 The Network Upload method is very complicated, and it requires much technical knowledge. So, it is not reliable for non-technical users. And there are chances of data loss. To overcome all these issues, you should use a third-party tool. 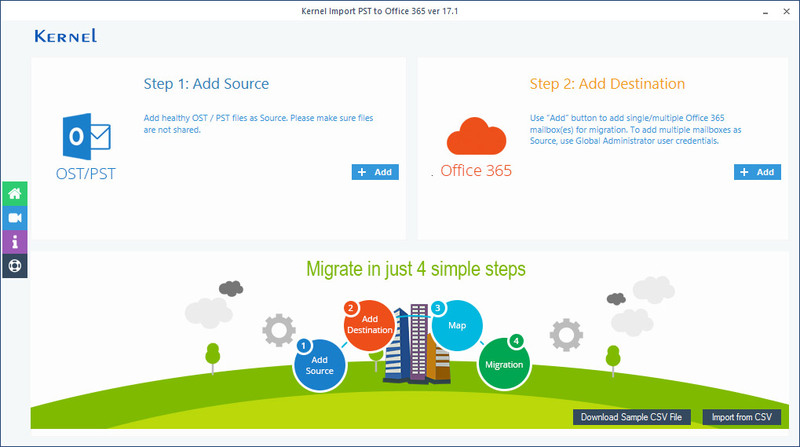 Kernel Import PST to Office 365 is designed to import single or multiple PST files to Office 365. 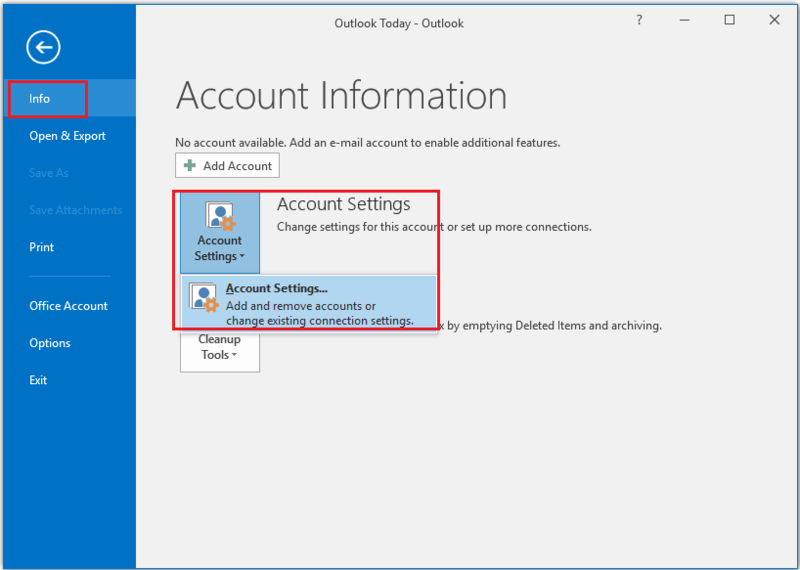 You can use either an end user account (for importing to a single/archive mailbox) or an Office 365 account (for importing to multiple mailboxes under this account). Efficiently imports healthy PST/OST files to cloud platform of Office 365. Allows to map PST files with Office 365 mailboxes - manually or using CSV. Enabled with inbuilt filters to segregate data before migration. 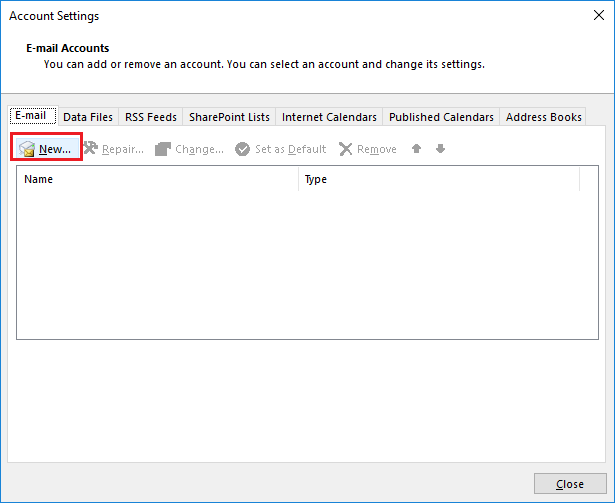 Option to save PST mailbox hierarchy to a separate folder in Office 365 mailbox. 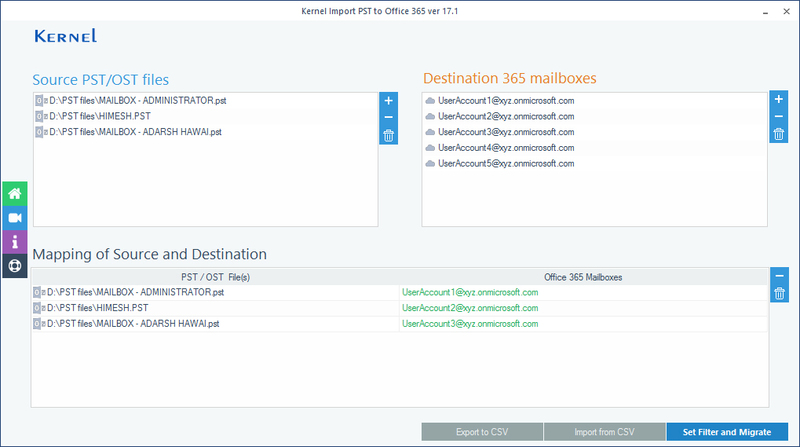 Allows using CSV file to import PST files to multiple Office 365 mailboxes. Provides a summary of import process (can be saved in CSV file). 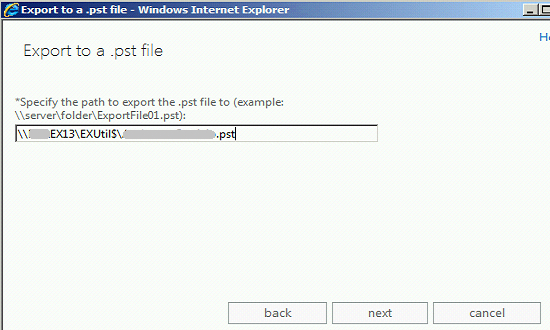 Add PST file as the source: The tool allows you add one or more PST file as the source. You can click the Add button and select the PST files from any location. If needed, you can also select OST files also as the source. Add Office 365 account as the destination: Now you can add an Office 365 account (user account or admin account) as the destination. Here, you have the option to migrate Single/Archive mailboxes or migrate multiple mailboxes in a single attempt. 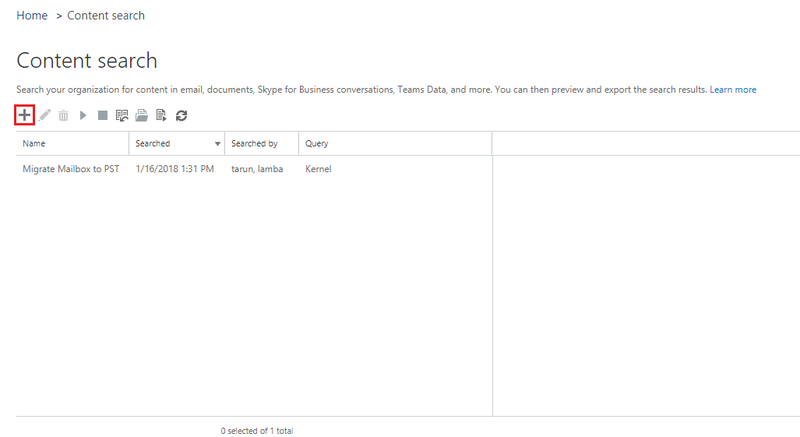 And with Office 365 global admin account, you can view the list of all the mailboxes under this account. You can also map PST files with corresponding Office 365 mailboxes as per your requirement. Apply filters and start migration: In this step, you are allowed to perform the selective migration. 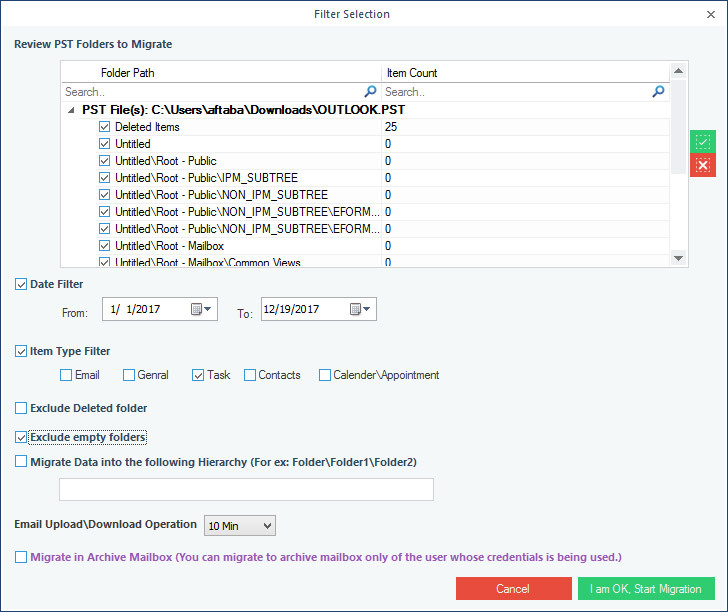 You can apply filters to your PST data before migration. You can also exclude empty and Deleted folder from migration. Once you have applied filters, then you can start migration. Save the PST import report: Once the PST import process is complete, the software displays the summary of the entire process. You my save this report to a CSV file. Does not require any other tool. Filters PST data by age, type, and owner. Filters mailboxes by Date Range, Item Type, Folders. Can exclude empty folders & Deleted folder. Office 365 has multiple features and services which are specially designed to help businesses to reduce their dependence on on-premises IT resources. It also offers great flexibility and enhanced security. But like any other data, Office 365 mailbox can also be backed up. Usually, this is done in PST format. And if you want to migrate Office 365 mailbox to Outlook, then also you need to save in PST format. 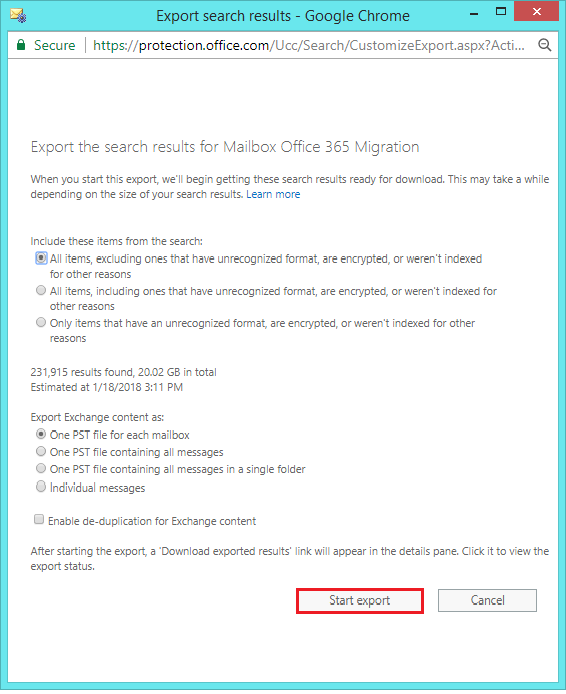 However, there is no special feature available in the Office 365 for this need – but the Office 365 feature eDiscovery can be used to export the Office 365 mailbox to a PST file. 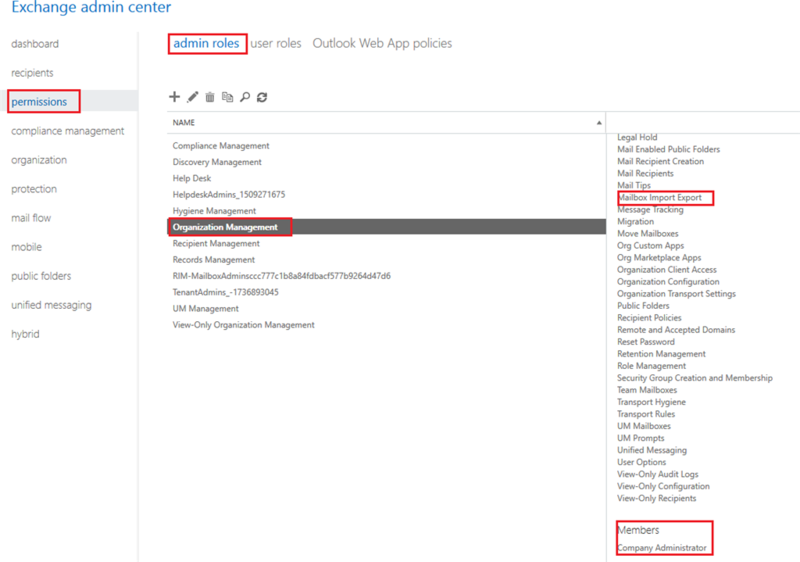 Login to Office 365 and go to Admin center. 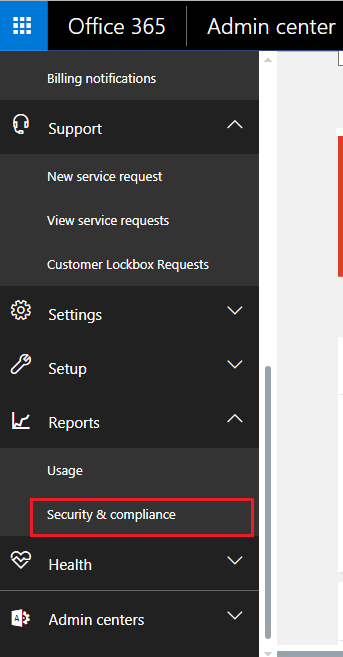 In Admin center panel, go to Reports option and click Security & Compliance. In Security & Compliance center, click the Reports dashboard option which will take you to the dashboard. Click Permissions. It will have multiple tools listed. 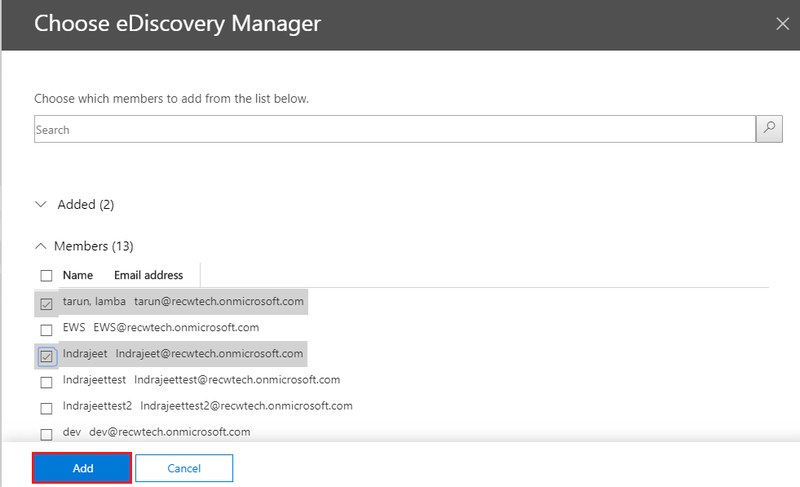 Among them is eDiscovery Manager tool which will export the Office 365 mailbox to PST. Check it, and then click Edit role group. 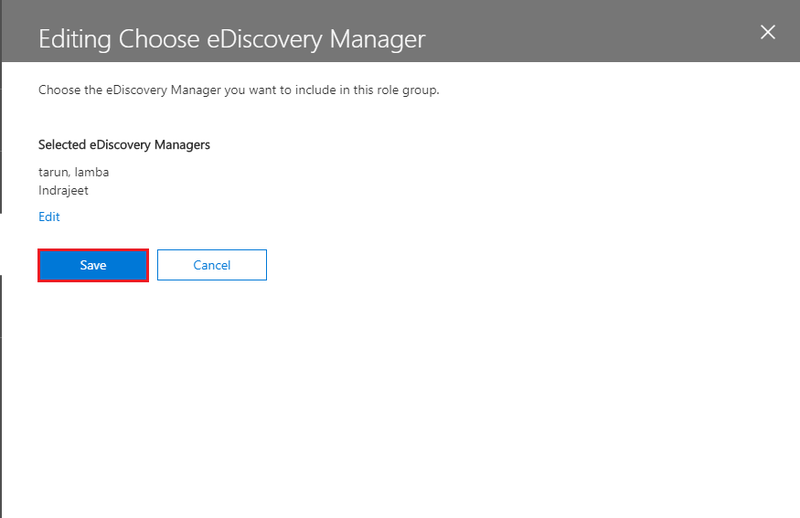 Now, go to Choose eDiscovery Manager where you need to choose a single or multiple accounts which will have the authority to export the mailbox. Choose accounts, and click Add. Click Done. Now, go to Search & Investigation. Here, choose the Content search option. Click the (+) button to add new Search content. Input name of the search content, and choose the desired options from where you want to search the content. The next window will let you choose if you want to put a keyword in the search content. But if you want to search the whole content, then leave it empty. After the search process is completed, the user can easily export the search item in PST format. Click the Start Export option. In Exports search results window, choose the desired options among the available and click Start Export. 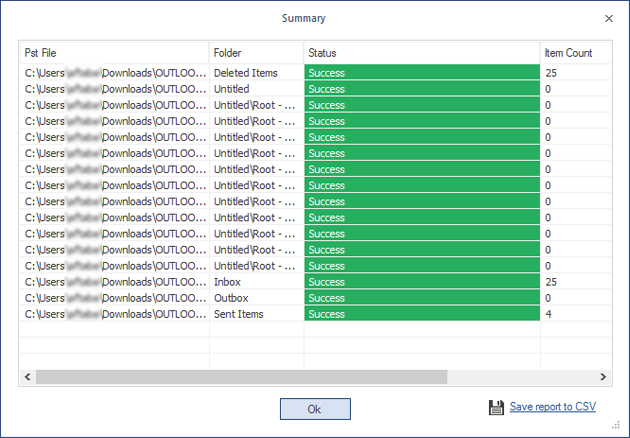 The tool starts exporting data and you can download the download exported results to see the whole migration report. In Export search results, you can copy the URL which will be used in the eDiscovery PST export tool and paste it there. Copy the selected URL in eDiscovery PST Export tool, provide a destination to store the migrated data, and click Start Export. The migration will start. 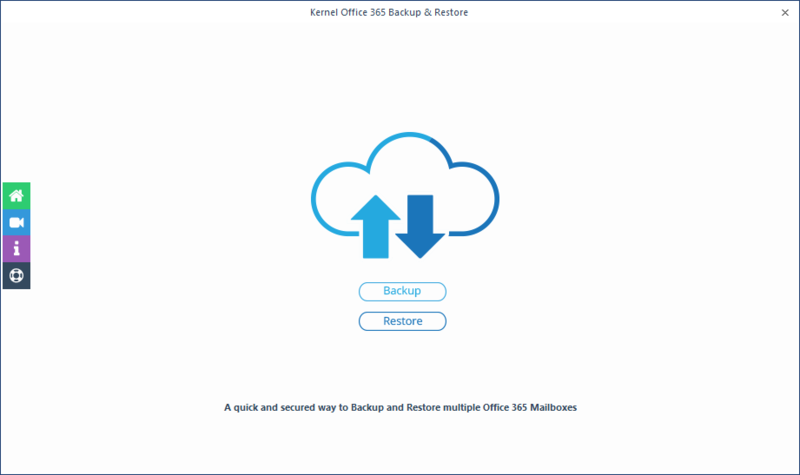 If you do not want to go through this tiresome, error-prone, or time taking the process of manually exporting the Office 365 mailbox to PST, then use Kernel Office 365 Backup & Restore which can easily access the Office 365 mailbox and save it in PST format at the user-defined location. Office 365 Backup tool has a highly simplified user-interface which any user with very office 365 credentials can use. Often, the users face difficulty in accessing Outlook 2016 PST files on Windows 10 computer. One of the reasons behind it is the improper functioning of MS Outlook when the user tries to open it. MS Outlook suddenly stops working, or it will not open, and the chances of losing crucial data or information within the PST file becomes very high. These problems might occur due to upgradation of Windows, the configuration of Microsoft applications, and many other applications or programs. The issues faced with Windows upgrade include incompatible software or configuration is not up to date, and this could be one of the reasons why PST file is not opening on Windows 10 computer. Issue 1: Incompatible programs: Windows operating system receive updates with time. However, installed applications on an operating system are not updated, and faces incompatibility issues take place. Outlook starts to produce errors, especially when MS Office Suite and more specifically Word is not updated. Issue 2: System files or applications are missing: At times, when the system files or application files are missing, Outlook desists from working properly. In many cases, the Outlook application is not installed completely and requires reinstallation for proper functionality. Issue 3: Abrupt system shut down: The sudden shut down of Windows 10 affects Outlook while it is in the process of email transfer. Later, it might start usually and abruptly shut down after opening. Issue 4: PST file becomes oversized: It is a prevalent problem when the PST exceeds the pre-defined storage space. Hence, Outlook does not read the PST file, and it stops working on a Windows 10 PC. 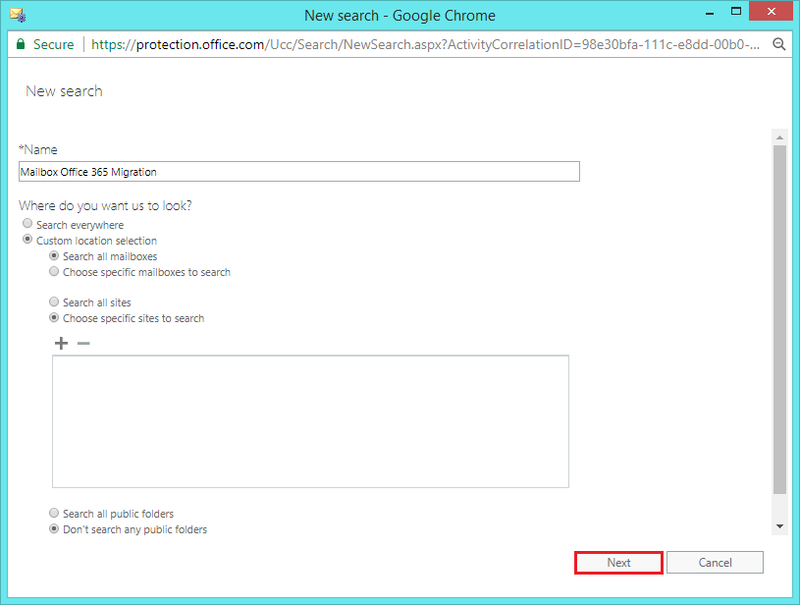 There are many ways to resolve the inaccessibility issue of Outlook 2016 PST file. To cut the long story short try the suggested fixes. It is an easy process but suffers several limitations like data loss and require technical expertise. Therefore, to overcome these limitations, the recommended fix is to use an Automated method which is best suited for non-technical users as well. In case the above manual method does not work, you can opt for a third-party tool which is another best and straightforward solution to fix such issues. 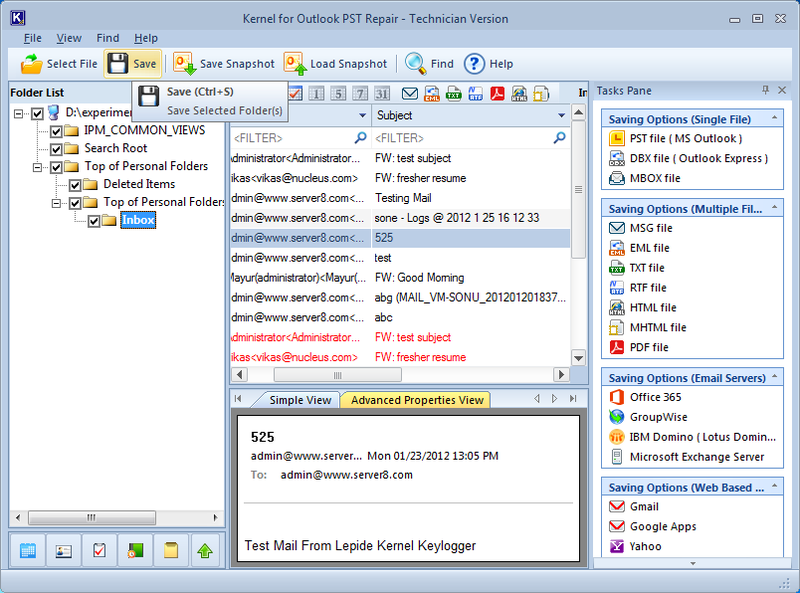 The IT professionals recommend Kernel for Outlook PST Repair tool. Such type of tools offer extensive features to technical as well as non-technical users at ease. We recommend the users to first use the inbuilt Microsoft utility first in case of issues with MS Outlook. If the problem still persists, use PST Repair tool to repair MS Outlook data files in a few clicks. 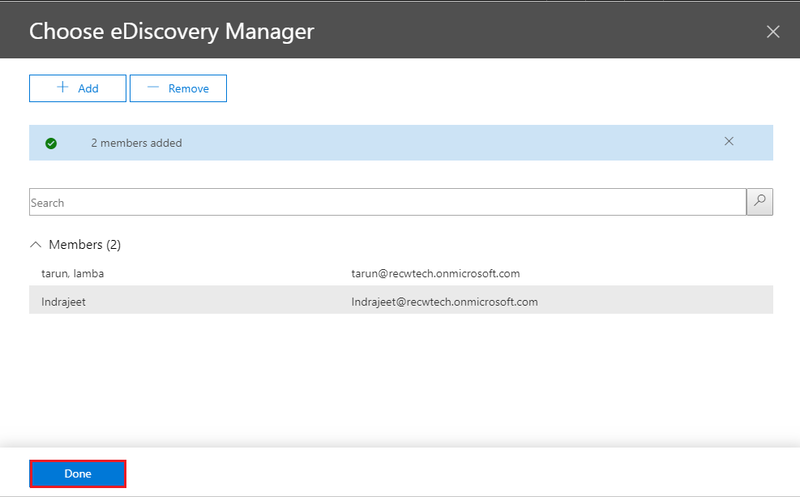 Deleted item recovery - Due to the Hold Policy in Exchange 2013, it is possible to retain all the deleted items in Recoverable Items folder up to a specific period so that end users can recover. This makes deleted item recovery, simpler, faster, and less expensive. Long-term data retention - In Exchange 2013, the features like In-Place Hold, Litigation Hold, In-Place Archiving, and In-Place eDiscovery help in the long-term retention and retrieval of data. Whenever a need (like legal requirement) occurs, the required data can be searched and retrieved. These features shorten the recovery procedure and eliminate the need of costly recovery tapes. Disaster recovery - Exchange 2013 continues to have Database Availability Groups (DAGs) to ensure the high availability of mailbox servers and to facilitate quick disaster recovery. The benefit of having multiple database copies in the Database Availability Groups is that at least one copy is always unaffected by other’s corruption. This feature acts as a perfect guarantee against data loss in case of hardware, software, network, and server failures. Point-in-time snapshot recovery - Exchange 2013 allows to create a point-in-time database copy in the Database Availability Groups. The copy in DAG can be used to restore to a previous point of time. This feature is helpful in the events like deletion of user mailbox data, replication of logical corruption to all database copies in the DAGs, etc. Exchange Native Data Protection works as an alternative to traditional backups. The benefit of Exchange. And the concept is to use the inbuilt Exchange 2013 features to avoid Exchange data loss. Native Data Protection is that it does not require scheduling the manual backups regularly. The core idea behind Native Data Protection is the combined use of Exchange 2013 high availability features and features like Litigation Hold, In-Place Hold, In-Place eDiscovery and In-Place Archiving to ensure complete protection of data. Exchange 2013 VSS Writer is the functionality used by backup applications to backup and restore Exchange data. VSS Writer actually facilitates Exchange backup/restore operations. First of all, reset the lost server’s computer account. Install OS again and name it again (with the same name). Add the server to its original domain. Open the command prompt in the server. Check the custom settings and reconfigure them as per the previous settings. To check whether the procedure worked on not, go to Windows Services tool (services.msc) and check if the Exchange services are running or not. Many professional tools help you recover Exchange data. 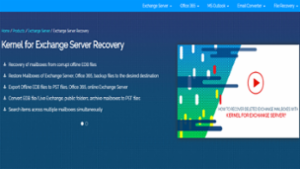 They restore mailboxes and public folders from offline Exchange database file to PST files or destinations like Exchange Server or Office 365. 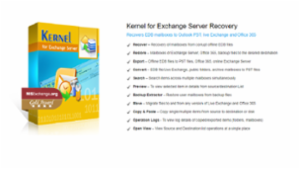 One excellent tool you can try is Kernel for Exchange Server. This Exchange Recovery tool supports recovery from EDB files created in all the versions of Exchange. And it is one of the easiest methods for Exchange database recovery. EDB to PST Recovery Software is well known program that easily recover data from EDB File and migrate EDB files to PST files without creating any problem. 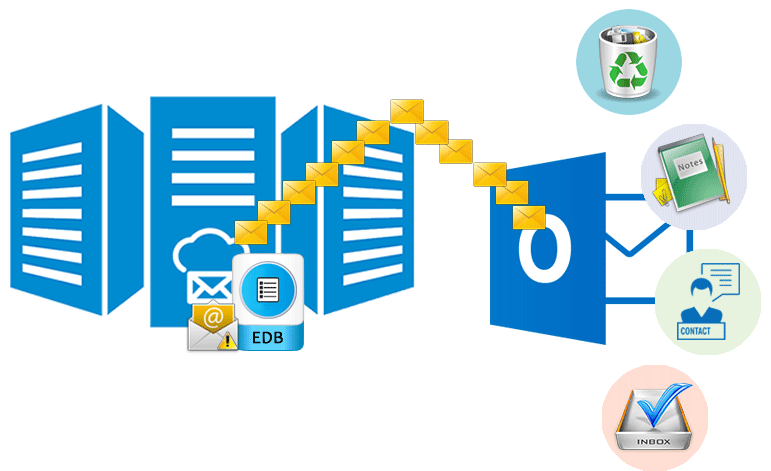 By taking help of EDB File to PST Converter Software you can select the emails one by one and export them into Outlook file with email properties- to, bcc, cc, time, subjects and from, email header information and embedded images etc. Exchange EDB to PST Converter Software is the one of the great utility that securely repair corrupted, damaged exchange EDB file and convert EDB mailboxes included- emails, inbox items, outbox items, journals and appointments. 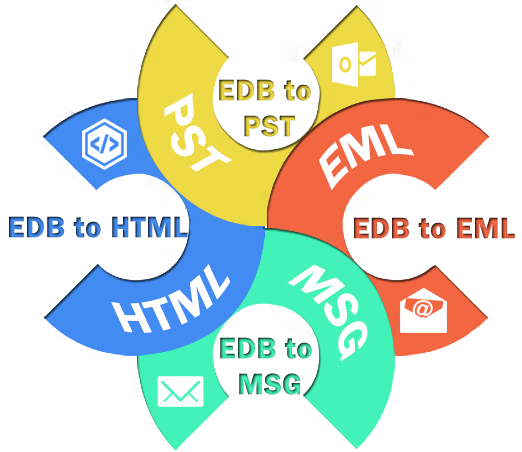 Using this EDB Converter Software you can restore EDB to PST, EML, MSG, HTML and EMLX format along with all emails properties and attachments. Software also split the oversize PST File by define size upto 5GB during conversion and also preview the complete emails attachments or items. As much as Microsoft wants to kill off PST file support, just as they tried to do with public folders, there are still times when it is useful or downright necessary to export Exchange mailboxes to PST files. So, let’s create a share, call it EXUtil$, share it with everyone, full control. For your NTFS Permissions make sure that the Exchange Trusted Subsystem object has full control. As a quick test just make sure you can browse to the share from the exchange server and that there are no networking issues stopping you. First, make sure that you are logged into EAC as the user that you just gave import / export permissions to. Now we need to find the user who we are going to be exporting to PST, click the ellipses (the 3 dots) next to that user and select Export to a PST file from the drop down. Now you have an option to export the contents of the mailbox or the contents of the archive. Select the one you want, if you want both you will have to submit two separate jobs. Next fill in the path of the share that you created before, also give the PST file a name. And finally, select a user whom you wish to notify when the job completes. Once the job has finished the PST file will appear in the share that you created! The manual Exchange Recovery process is so complicated that only a technical expert who was worked extensively on Exchange server can perform the whole procedure. A normal user will find this method quite hard to follow and that is where Exchange Recovery tool comes to the rescue. It is specially developed to assist user in performing EDB to PST conversion within minutes. It has a highly user friendly GUI which make even a novice Exchange user to complete whole procedure in three simple steps. Get special support from sifo systems exchange server experts .The helpline are active for 24*7 and you can ask any of query related to exchange server data recovery free of cost . Go for sifo systems edb to pst recovery software and use this application for removal of virus from exchange ,recover of edb file and conversion of edb file to pst file . Software smartly convert edb file data to pst file with all of data like as inbox,calendar ,notes,contacts,task,etc . This software has good and very smart working with every of edb file such as edb 2016,edb 2013,edb 2010,edb 2007,etc .